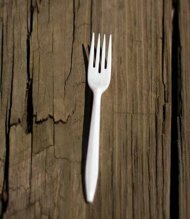 Man Has Fork Lodged in Stomach for 10 Years -- No Forking Way! So there's this man across the pond in England who goes by the name of Lee Gardner. Gardner was recently complaining of severe stomach pain and (sorry to be graphic) found blood in his vomit -- poor chap. Naturally, he went to the hospital, doctors operated, and you will NEVER believe what they found. Ready for it? A 9-inch plastic fork lodged inside of his tummy scratching the lining. Casual, really. It turns out that 10 years back, Gardner was "playing around" with the disposable fork when he gagged and "accidentally" sent the four-pronged item down his throat and into his stomach. Um. Erm. Ow? Even better, though (trust me) after the whole shebang happened, he went to a doctor who told him it was no biggie, and it would pass. Wait. Who the hell would be OK with a response like that?! He had a FORK IN HIS STOMACH -- for crying out loud! Yeah, not me. What's even more bizarre is the idea that when this pain was happening, you know, the one that made him vomit blood, he didn't think to himself "Gee, I bet this has something to do with that fork I swallowed a few years back." Crikey! I can't help but wonder what WAS Gardner doing when he "accidentally" swallowed the darn fork. Was he, oh I don't know, eating spaghetti that got so twirled in there that the fork slurped down with it? Or possibly really really hungry after a long day of gardening and needed to find immediate sustenance? Or AH-HAH! I know! He MUST have been eating a sandwich in such a hurry that he inhaled the whole thing, fork included. Duh. What foods are white? Rice. Did he confuse the plastic fork for a really really long grain? Nah. Couldn't be. Sigh. Nothing surprises me these days. Not to worry though, Garder's OK. The fork's tines may had left a bad ulcer that led to the internal bleeding, but he's chipper as ever that the pain's gone and looking pretty good. The fork they took out of his stomach -- not so much.